Napoleon Bonaparte (1769-1821) - The dominant world figure at the beginning of the 19th century. 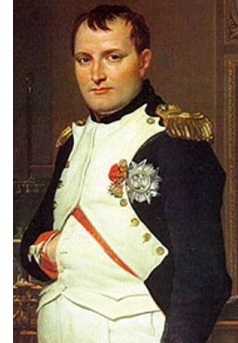 For the first decade of that century, Napoleon Bonaparte more or less dictated geo-political events on mainland Europe. Only the island-nation of England, with its powerful navy remained outside his influence. Nevertheless, even it had to make policy decisions with Napoleon's rule in mind. He was technically not French, but Corsican; born on the island, albeit one year after France took possession of it from the city-state of Genoa. His family was of Italian ancestry, but he worked hard from a young age to fit into French society. When he was ten he attended school on mainland France in order to learn the language; but he would speak with a noticeable Corsican accent for the rest of his life, and never fully learned to spell in French. Shortly after he was accepted to the military academy in Brienne, followed by the École Militaire in Paris. He trained to be an artillery officer and graduated in 1785 as a second lieutenant. When the French Revolution broke out, Napoleon was on Corsica and found himself in the midst of a struggle for control of the island. Despite being promoted to captain, he was on the losing end of that struggle and forced to flee to France. But that's when his fortunes began to change. In 1793, he published a political pamphlet called Le Souper de Beaucaire (Supper at Beaucaire). It caught the attention of Augustin Robespierre, younger brother of Maximilien Robespierre (see French Revolution). He brought Napoleon to Paris and made him artillery commander of the government's security forces. However, during the Reign of Terror, the Robespierres were executed and Napoleon was imprisoned as their political ally. But after an investigation, he was cleared and released. Then in 1795, he saved the government from collapse when he successfully defended the Revolutionary forces (those in power at the time) from an assault by the Royalist forces (those who had lost power). The victory made him a hero in France and he was promoted to general. All the time his power was increasing as was his influence over the people. In 1798, he launched his famous Egyptian campaign. The expedition produced mixed results. He wrested the region from the Ottoman Empire by winning the Battle of the Pyramids, and recovered the Rosetta Stone (see Rosetta Stone found). However, his navy was defeated by Horatio Nelson (see Lord Nelson), which forced him to abandon his plans of breaking up the British East India Company. Eventually he had to withdraw from Egypt and the area came under the control of Great Britain. Back in France though, his popularity was as high as ever and he, along with several conspirators, staged a successful coup of the government in November 1799. He then outmaneuvered his fellow conspirators and seized total control of the country. By 1800, he was a virtual dictator in France. Napoleon did not specifically set out to conquer Europe (at least not initially). It essentially happened because most of the other countries of Europe were aligned against France due to the French Revolution. When Napoleon took control, he set about expelling those countries and was so successful at it, that he ended up conquering most of Europe in the process. For the rest of his time in power, the other nations of Europe formed coalitions to try and overthrow him. These conflicts are known collectively as the "Napoleonic Wars". In the early part of his reign, he was known for more than just his conquests. In fact, he was pretty popular outside of Europe and was considered an enlightened leader. His famous Napoleonic Code was considered the standard by which countries should be governed (and in some places still is). 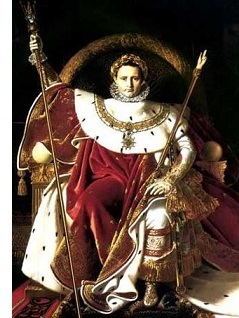 On December 2, 1804, Napoleon became "Emperor of the French" when Pope Pius VII crowned him Emperor Napoleon I at Notre Dame Cathedral (or more accurately, he crowned himself when he grabbed it from the Pope's hand and placed it on his own head). With all his success, Napoleon likened himself to a modern-day Caesar. Exactly one year after his coronation, he reached the height of his power by wining the Battle of Austerlitz on December 2, 1805. It is sometimes called the Battle of Three Emperors because it was a combined effort by Tsar Alexander I and Holy Roman Emperor Francis II to overthrow Napoleon. Through superior tactics, Napoleon decisively beat a much larger army. It is considered perhaps his greatest victory and brought about an end to the Holy Roman Empire. For the next seven years, the other European powers tried and failed to dislodge Napoleon from power. But all that changed in 1812. That year, he foolishly invaded Russia, and things began falling apart (see French Invasion below). Virtually his entire force was wiped out, not by the Russian army, but by the Russian winter. In December 1812, Napoleon was forced to abandon the campaign and return home. The humiliating loss encouraged the other nations to rally against France and try once again to bring Napoleon down. Great Britain, Prussia, Austria, Sweden, Spain and Portugal all teamed up to form the "Sixth Coalition". Napoleon managed to raise another substantial army and initially fended off the attacks. He won the Battle of Dresden in August 1813. But the numbers were not in his favor. In October of that year, a massive coalition army attacked his forces and won the Battle of Leipzig. It was the largest battle in history on European soil prior to World War I. The coalition offered terms which would allow Napoleon to remain in power, but he would have to cede all land he acquired since becoming emperor. Napoleon was confident of ultimate victory and stalled for time. The coalition took that as a "no" and prepared for another attack, at which point Napoleon changed his mind and agreed to the terms. But it was too late by then. The Allies proposed new terms, but they were harsher. France's borders would return to where they were before Napoleon rose to power at all. He rejected these new terms. But his forces had been reduced to 70,000 men. Despite putting up stiff resistance, he did not have the manpower to hold off the coalition. The Allies surrounded Paris and Napoleon was forced to surrender in March 1814. He was exiled to the island of Elba the following month, but escaped in February 1815 and returned to France. King Louis XVIII sent a regiment to intercept him, which it did at Grenoble on March 7, 1815. Napoleon had no chance of overcoming the armed soldiers, so as he approached, he dismounted his horse, raised his arms and said, "Kill your Emperor, if you wish." The soldiers lowered their weapons and shouted, "Vive L'Empereur!". They marched to Paris and King Louis fled. News of his return spread quickly throughout Europe and the allied nations scrambled to assemble a new force in order to depose him. The conflict culminated at the Battle of Waterloo on June 18, 1815. Napoleon lost. This time he was exiled to the island of St. Helena in the Atlantic. He died 1821. Napoleon Bonaparte was considered such a brilliant field commander that his battles are studied by military analysts to the present-day and he is considered one of greatest military tacticians in history.